This pate of wild boar with bilberries and thyme was developed in Provence in the traditional way (large hash) without preservatives, colorings, gluten nor lactose. 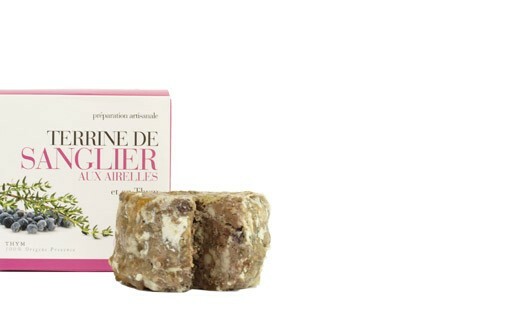 The recipe will work wonders as an aperitif or accompanied by salad. Pork throat 60%, origin : France. Pork liver 15%, origin : France. Wild boar 20%, origin : UE. 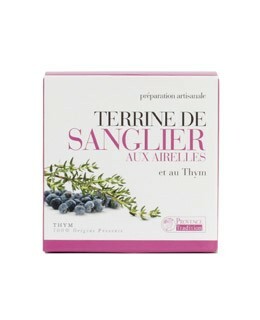 Bilberry 0,5%, red wine, salt, pepper, garlic, thyme from Provence 0,38%. Founded in 1987 and settled in Avignon in the heart of the production region, Provence Tradition honors the farmers that shape the landscape of Provence by honoring their products. By adhering to the principles of an agriculture that cares about its environment Provence Tradition effort to improve the conduct of operations and chose to act accompanying the re-cultivation of species on their land of origin.